The classic cookie made even better. Chocolate chip cookies are a staple of baking. The universally loved cookie has been trying to get with the times of late, as variations on the classic are everywhere now. However, obscured by all the noise of lesser cookies, an alpha cookie exists. Of course I’m talking about the goodness that are chocolate chip cookies that are baked with a gooey Nutella center. Don’t believe me? You’ll just have to bake them and see for yourself. *You can definitely cut down on the chill time if need be. I would recommend 2 hours, but I did mine for 30 minutes and they were fine. 1. Place your jar of Nutella in the fridge so it will be chilled by the time you need it. 2.Pour your flour, salt and baking soda into a large bowl and whisk them to an even consistency. 3. Heat your butter in a saucepan using medium heat. Whisk the butter the entire time. Keep the butter in the pan until you see it begin to change to a brown color. Continue to whisk the butter, and when it begins to all turn brown, it will give off a very strong, rich nutty smell. When you smell this (trust me, you’ll know when this happens), transfer the butter into a mixing bowl to cool. 4. Add your sugar, egg, egg yolk, vanilla extract and Greek yogurt to the bowl with butter, and whisk until it has an even consistency. 5. Add in your dry ingredients and mix —then toss in your chocolate chips. Chill dough in the fridge for 2 hours. 6.Preheat your oven to 350°F. Remove the chilled dough and begin to form balls about 1 ½ tablespoons in size. 7. Press downward gently on the top of each ball to make a small opening and place roughly 1 teaspoon of Nutella in the middle. Fold the balls back up so you cannot see the Nutella. 8. Place each ball on a baking sheet gently to ensure that the Nutella does not ooze out. You can do this by lightly flattening the bottom of the cookie. 9. Bake the cookies for about 10 minutes, or until they begin to brown on the edges. It make take a bit longer depending on your oven. My cookies took about 15 minutes of cooking time to bake well. 10. 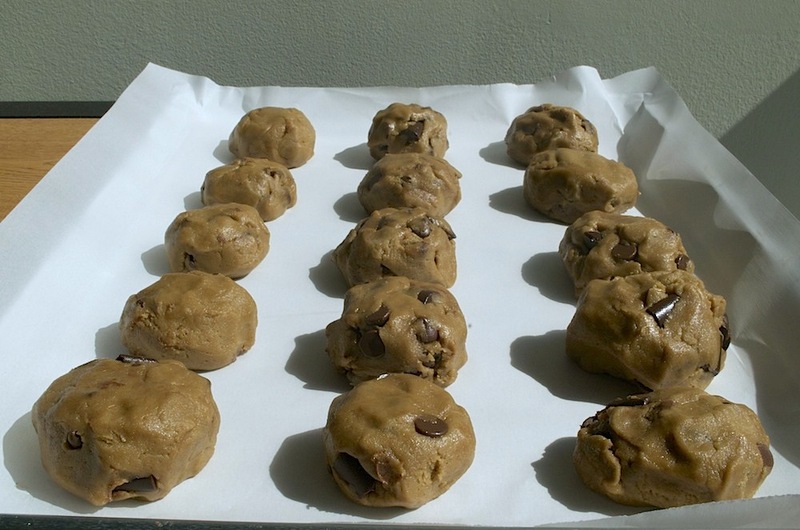 Remove the cookies from the oven and allow them to cool for 2-4 minutes. Remember that they will still cook a little bit as they cool off. Author’s note: I cannot be held liable for the effects that these Nutella chocolate chip cookies will have on you. Consumption of said cookies has been reported to cause feelings of nirvana, kitchen hysteria and intense cravings and withdrawals.